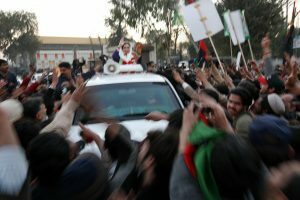 27th December 2007, Benazir Bhutto was assassinated around 6 pm local time, on her way back after a successful public gathering at ‎Liaquat National Bagh, Rawalpindi. Its aftermath is still an instructive lesson for Pakistan, the critical situation still prevails. Both the presidents of Pakistan and US at that time Bush and Pervez Musharraf laid the blame on Al-Qaida and extremists, and forces who worked in the context of the war on terrorism. Such forces still pose a threat to democracy. But the world has ignored this facile scenario and has created conflicting cross currents in Pakistani politics. Benazir Bhutto will be long remembered as a modern Muslim woman who became Pakistan’s first woman prime minister, was like her father Zulfiqar Ali Bhutto, articulate, courageous and charismatic politician. 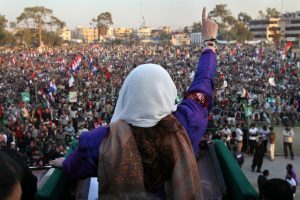 The circumstances surrounding Benazir Bhutto’s assassination highlight the key factors that contribute to the fault lines of Pakistani politics, problems that have been aggravated exponentially as post 9/11aftermath. A deep rooted and unresolved identity problem regarding the relationship of Islam to Pakistani national identity and politics; the role of Islamic parties and movements and their clashes with a westernized elite; and a strong military that has intervened throughout Pakistan’s political history and resulted in more years of military rather than democratic rule, and the role of feudal political leaders. The nation is still perplexed, that the PPP after winning the elections, for which Benazir Bhutto had been campaigning, could not arrest the actual person responsible for the assassination. Later a UN inquiry was called. The findings of the UN inquiry into the assassination said that this could have been prevented of proper security measures had been taken by that time government. The report, compiled by an independent commission appointed by the UN, concluded that because of the presence of persuasive politicized intelligence agencies hampered the investigation. 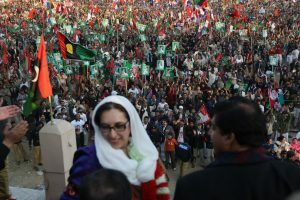 The failure of the police to investigate effectively Benazir Bhutto’s assassination was deliberate; it also urged Pakistan to launch a credible probe, which could be a major helpful step towards impunity for political crimes in the country. The head of the commission, Heraldo Munoz, said the authorities failed to protect her who was candidate of forthcoming 2008 national elections. The aftermath of 27 December assassination was horrendous. 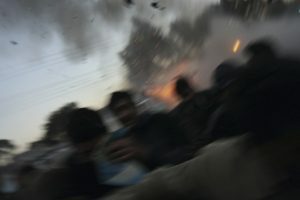 Over 100 people died in the incidents related to mass protest, either by police or in the crossfire of different groups. 63 railway stations, 29 locomotives and 149 bogies were burned or damaged resulting over 12.3 billion direct losses to the Pakistan Railways. The whole rail system had collapsed for the night of December 27. Thousands of passengers were on the railway stations waiting for restoration. There was no sign of restoration for some days. 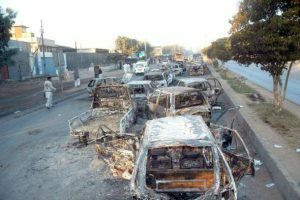 Thousands of private cars were damaged all over Pakistan by the angry mobs, the houses and offices of politicians, local government mayors and administration were either being burned or damaged. Amidst three days shut down, the benchmark index, the KSE100 index, of the Karachi Stock Exchange fell by 4.7%. The Rupee fell to its lowest against the U.S dollar since October 2001. 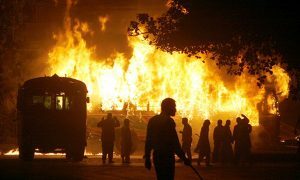 Karachi suffered losses of 1 billion dollars in the first four days after the assassination. By the fifth day the cost of countrywide violence and protests mounted to 8% of the GDP. I personally can never forget the developments of that day. I used to work for a news channel at that time and I had my weekly day off from the office that day. But I went out to finish some pending chores. I was at KDA market Gulshan-e-Iqbal, Karachi, when I received a call from office from an on duty colleague. I was told to return home at once, Bibi had been shot. The news spread like wildfire across the city, nay across the world. Accompanied by my mother, we couldn’t find any ride back home. All the streets across the area were shut down. The air was filled with the strong smell of smoke and burning tires. We kept walking towards home, avoiding the main road. Fortunately, I was residing few blocks away from the market. Don’t remember how long it took to get back, but those hours were the longest of my life. The reverberations from those gun shots that killed Benazir Bhutto will be heard forever in the history of Pakistan. The principal question, who was responsible for the plot which led to her assassination, remains unsolved to this day 27th December 2017.